Trip back to the 1930's and you'll find it's not Wolverine that's the talk of the town, it's Doc Savage. Now the 'righter of wrongs' returns to the modern day home of icons; DC Comics, in the upcoming BATMAN/DOC SAVAGE special. 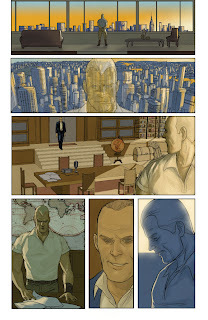 With Brian Azzarello at the pen and Phil Noto at the pencil, the oneshot kick-starts a whole new pulp-inspired universe; 'First Wave'. Now before the waters lap the shore, here's a quick run down on how the one of the biggest icons of the past relates to and inspired some of the biggest icons of the present - and more importantly why you need to keep an eye out for him and his crew on the shelves this Wednesday. SUPERMAN: Both heroes had an artic escape called the Fortress of Solitude, if that and the nicknames dont show how much of an inspiration the 'Man of Bronze' was on the 'Man Of Steel' nothing will. BATMAN: Embodying the pulp ideal of what a man could become through hardwork, scientific training, exercise and owning a fortune in gold, Doc Savage also contained the hero's own exercises - so you too could hone your body to it's peak. WONDER WOMAN: The amazon's next best 'set of assets' were a gift from the Gods of Myth, however renowned Doc Savage author, Lester Dent, described his hero as a mix of the deduction of Sherlock Holmes, Tarzan's physical ability, Craig Kennedy's scientific education, and Abraham Lincoln's goodness. The Code of Doc Savage: Let me strive, every moment of my life, to make myself better and better, to the best of my ability, that all may profit by it. Let me think of the right, and lend all my assistance to those who need it, with no regard for anything but justice. Let me take what comes with a smile, without loss of courage. Let me be considerate of my country, of my fellow citizens and my associates in everything I say and do. Let me do right to all, and wrong no man. For more on Doc Savage and his gang visit The Source Blog. It'd be kinda fun to see DC start a "Pulp" imprint and do Doc Savage, Tarzan, The Shadow, Justice Inc., etc... comics again. Or maybe an anthology title featuring all those characters? Hey Rob - that's what I'm hoping 'First Wave' will lead to aye!